preparing content for online marketing campaigns. Marketing techniques that work in many sectors often fail when applied by infrastructure firms, because the infrastructure industry faces unique marketing challenges. Coercive or multiple-exposure strategies (sometimes called “interruption marketing”) that work well in retail or business-to-consumer environments underperform or are actually counterproductive; it therefore makes sense for marketing executives in the infrastructure industry to adopt an overall approach that emphasizes educational and reference materials. Information marketing—also known as content marketing or educational marketing—is an effective way to engage and persuade skeptical customers, and keep their interest as they negotiate long sales cycles. What makes the infrastructure industry different? There has been comparatively little scholarly study of the infrastructure industry from a marketing perspective. However, there has been a great deal of study done on the technology sector, and there is substantial overlap between infrastructure buyers and technology buyers. This report relies on several recent studies that examine technology buyers and marketers, on hundreds of interviews conducted with infrastructure marketers, buyers, and end users, and on the author’s 16 years of experience at the California Department of Transportation (CalTrans) and as a project manager at an Engineering News Record (ENR) 400 consulting firm. Skeptical Purchasers: Purchasers in the infrastructure industry typically have an engineering background, are purchasing on behalf of engineers, or are actually engineers themselves. As such, they value comparative, fact-based information with references, and will consume a lot of this kind of material when making purchasing decisions. A March 2007 survey of 4,000 technology buyers and marketers revealed that 85% of buyers need to see at least three pieces of content about a new technology or product before they feel they have significant knowledge of it. 18% need to see five or more pieces of content. The same study showed that buyers overwhelmingly preferred current, solution-oriented, industry-specific material. 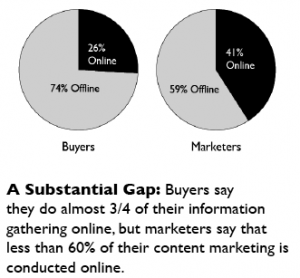 Buyers are not automatically suspicious of vendor-supplied content. More than a third of buyers said that they obtained the majority of research information from vendors and 80% reported that they get at least 25% of their research from vendors. According to a May 2007 survey of 3,000 technology buyers and marketers, buyers do most research online, and are sophisticated in their approach to research. 56% use phrases of three or more words when looking for information, and 19% use search operators. 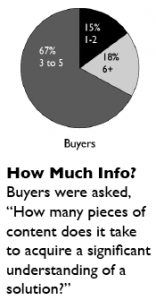 As shown above, such buyers do look to vendors for relevant research—the majority read paid ads that show up alongside search results, and 34% click on ads “sometimes” or “frequently.” Interestingly, 80% of buyers say that “offline” marketing materials, like magazine advertisements or direct mail, piqued their interest and drove them online to do research. Marketers should also keep in mind that buyers at government agencies, such as municipal directors of public works (DPWs) tend to have long careers in one jurisdiction. They are acutely aware that they will have to live with, and answer for, the results of their decisions. Consequently, they are more than ordinarily motivated to do due diligence. Long Sales Cycles: For many reasons, infrastructure industry purchases are subject to very long sales cycles, even compared to the rest of the technology sector. Customers and prospects are often government agencies, or are ultimately contracting to government agencies. This means that purchasers are often forced to meet written specifications, satisfy a committee of elected representatives, and/or are subject to stringent regulations and inspections. They may be required to issue requests for proposals (RFPs) or bid documents. There are, in other words, effectively no impulse purchases in infrastructure. Purchasing may also be subject to budget cycles or seasonal acquisition, or companies may have a policy of buying several year’s supply of some commodities at one time. Put another way, infrastructure vendors are nearly always pursuing business-to-business (B2B) sales rather than business-to-consumer (B2C) sales. A great deal of research shows that B2B purchasers spend more on average purchases than consumers, take more time to make decisions, and involve more people in the purchasing process. WANT TO READ THE REST? SIGN UP BELOW FOR THE FREE PDF!